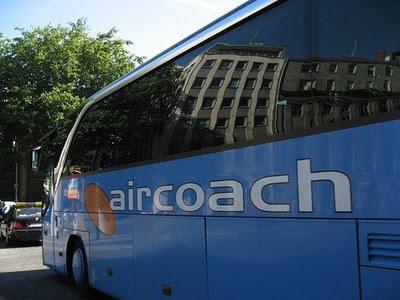 PAUL DERVAN: Create a GPS iphone app for aircoach? Create a GPS iphone app for aircoach? I'm a big fan of aircoach. As I said before, it is definitely a brand I'd miss if it disappeared. They come regularly. The drivers are polite. The bus is always clean and comfortable. And is decent value. More expensive than CIE bus but a lot cheaper than a taxi. It has my businesss for the foreseeable future anyway. But while I always use aircoach on my way home from a trip - I don't always get it to the airport. I'm generally in a hurry to catch a flight. The aircoach may arrive on time. But I can't take the risk. So I often get a taxi out. But if aircoach had a GPS app for my iphone, this would eliminate the risk. If I could see, on my iphone, that my aircoach is already in Donnybrook, I could calculate how long it would take me to walk to, say, the Leeson St stop and be on the bus. My dad's response would be to "just leave 30 mins earlier and you'll be fine". He would be right of course. But that's not the point. The reality is I never leave earlier. And am always rushing to the airport. And I'm guessing I'm not the only one. And the important part is - if there were an app, aircoach would have more of my business. Anybody know how to create one? P.S. I did see a link for 'live position' on aircoach's site but couldn't access it on my mac or iphone. Excellent idea. I'm always rushing to Dublin airport too, and I use Aircoach. This app would be very welcome. I still wouldn't trust an application to let me know where the bus was. I just get where I'm going a bit earlier than I need to and be done with it. But there's probably more people like you than there are of me so an application is a good idea. If the app fails and someone misses a flight because of it, they become the worst company in the world though - a risk worth taking? Funny, yesterday I saw a tweet from I can't remember who wondering why trains don't tweet. One day they will no doubt. I love aircoach..it leaves from the end of my road (new driver on the route isnt all that polite though!). Anyway, this would be great, especially for my return trips, I am never sure what time the buses are at so would love to know from the plane if I need to run or have time to catch the aircoach home (costs a tenth of the cost of a taxi). PS was on their sister company over the wkd, Rail Air, and they have free wifi, now that its owned by First Group hope they bring that in here too. cheers lads. Anybody know how difficult / costly it would be to create an app like this? Wifi is on all of the 08/09 Aircoach vehicles. Not a fan at all after they bullied me into putting my very small bag in the hold of the coach, then denied all responsibility when we arrived at Greystones and the bag had been taken by another passenger, with 2 days of shopping in London within it. I walked home with only my handbag and the clothes I stood up in to show for my mini-break.- a very precious break as you know. 6 months later the small claims court found in my favour as and I was compensated. Didn't bring back my vintage threads. he might come up with an iPhone app. I'm gonna stick with the DAA €7 pre-booked parking myself thanks very much. hi Lisa, guess that wasn't a great customer experience. I have to say, I've never had a problem with them.